For wider requirements, our Baking Parchment 450mm width makes for the ideal choice for high-traffic kitchens or catering environments. Designed with a non-grease, non-stick silicone surface, this easy to cut paper is provided on a roll for compact storage and in a perforated box for a clean and straight cut every time. Lightweight but durable, this paper is suitable for both oven and microwave cooking while also working well in the freezer for ensuring items do not stick together. A great alternative to traditional baking paper, our baking parchment is the ideal choice for creating everything from sandwich wraps through to fruit cakes and much more. To ensure your next meal is as exceptional as you'd expect, we also stock a variety of Cling Films and Aluminium Foils in our Catering category. 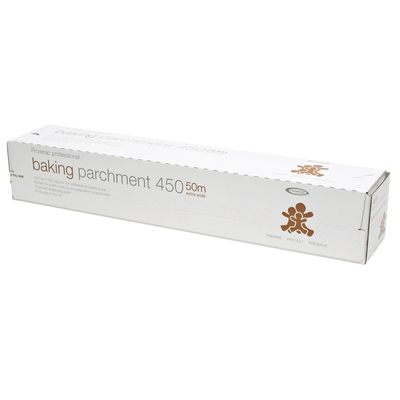 Our Baking Parchment is also available in the shorter length of 30cm and is available here to browse.